The Strangers # 3: The Explosive Debut of TNTNT! This issue starts off in the middle of a huge donnybrook (always wanted to use that word) as our heroes are attacked by the forces of TNTNT. In a classic, old-school fight scene, all the characters not only insult one another but find the opportunity to give their names and powers. From a modern perspective, it’s all a bit forced but having grown up with comics of the Seventies and Eighties, I’m perfectly okay with it. So… who the heck are thee guys who call themselves TNTNT? Well, there’s a big dinosaur-like guy called Tyrannosaur, a spunky young woman named Neu-Ronne (yeah, terrible name), a gun-wielding samurai named Tugun, a water-witch named Naiad and a strange floating armored man with energy-based arms and legs dubbed Torso. We’re told that TNTNT has been in training for three years, mastering their abilities for the day when they would be called upon. This gives them a tactical advantage over The Strangers, who are not only new to their powers but to working as a team. Employed by J.D. Hunt, they’ve been sent to retrieve Candy (aka Electrocute). In flashbacks, we also get to see The Strangers meeting Bob’s parents and having a discussion about building a public branding for the team. We get references to Michael Jordan and product endorsements as Englehart plays with the elements of fame in the 90’s. We also see the group getting their costumes for the first time — Leon is less than pleased with what Elena comes up with for him, rejecting all three designs. In the end, he sticks with his own clothes, preferring to have his legs relatively free in shorts. Despite the fact that TNTNT has the advantage in terms of experience, our heroes emerge victorious and take the opportunity to introduce themselves to the media. For the first time, they’re officially introduced to the world as The Strangers. In the first of several epilogues, G. Lawrence Bushnell, one of the other passengers from the cable car accident, learns of his own ultra-abilities… and they seem much darker and evil than the ones given to The Strangers. We then get an update on the man who got the shrapnel in his brain, as he finally wakes up (you’ll learn more about him in the pages of Night Man). After a check-in with J.D. Hunt, we move over to Hardcase’s home, where The Strangers drop in unannounced, heralding their first ever… crossover! This issue is a fun one if you like superhero fights. Englehart manages to pack in a lot of characterization with the flashbacks that surround the brawl with TNTNT and we continue to see developments in how The Strangers’ powers work. I really liked how Elena’s background in fashion and business played into the birth of the team’s public image, though I had doubts then (and even more now!) about Leon’s personal fashion choices. 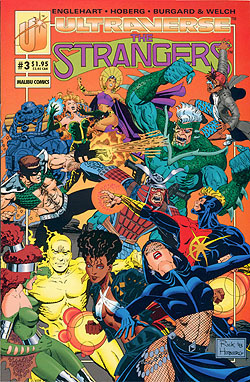 TNTNT would go on to appear in other Ultraverse titles besides just The Strangers — and while they’re kinda fun, there’s nothing here that left me particularly excited about them. Their dialogue was really stilted (this was especially true of Tyrannosaur) and given the size of The Strangers, having that many villains running around made some of the pages seemed really busy. Art-wise, there are some gorgeous panels here and there but the presence of two inkers led to some pages looking a bit rougher than harder-edged than others. The promise of a crossover with Hardcase didn’t leave me breathless with anticipation at the time as I was never a huge fan of that character. But as we’ll see, there are some really fun moments coming up in issue 4 and I think you’ll agree that in the end, the event turns out to be an entertaining one.